What is the innovative layout of Auto Mail Sender™ Standard Edition (AMSSE)? Screenshot A: the composing layout of our automatic email reminders. Download AMSSE to send automatic reminder emails! Screenshot B: the composing layout of Gmail, cannot use as the automatic email reminders (cannot send email reminder). 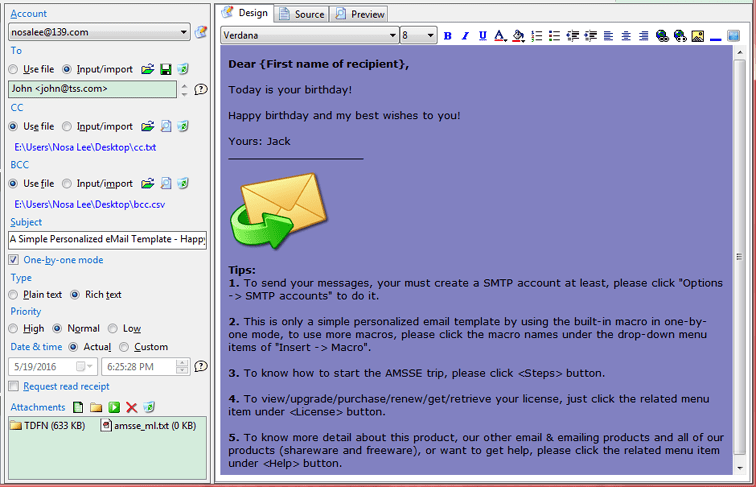 Screenshot C: the composing interface of Thunderbird, also cannot be used as the automatic email reminders (cannot send email reminder). 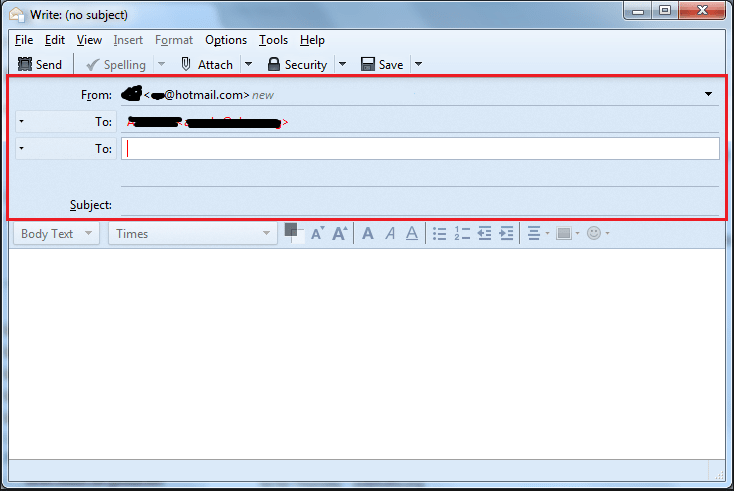 As above, the email composing layout of most email programs/webmails is vertical structure - header at the top of content. But our product is horizontal layout - puts the header at the left of content, and you can resize header and content boxes, even hidden the header or content boxes by <Toggle> drop-down button or the splitter. So we also consider it as a feature of AMSSE - innovative layout. But only refer to above screenshots between AMSSE, Gmail and Thunderbird, you may be difficult to agree with our opinion. Now, continue reading, you will know why. 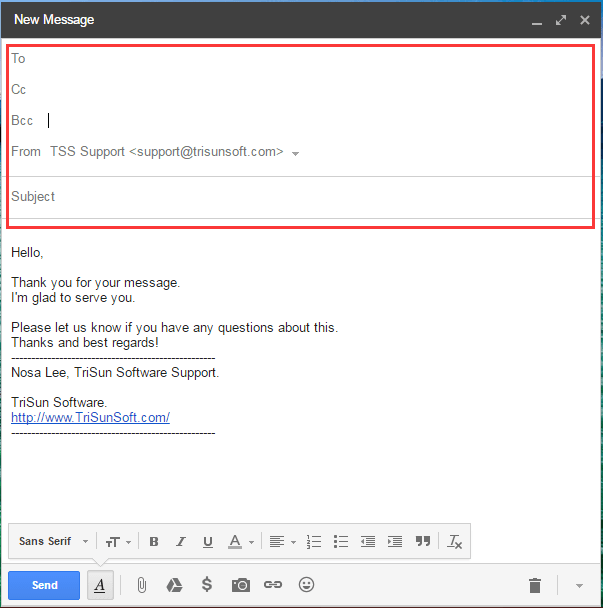 Why the eMail composing layout of AMSSE is innovative? Today's popular monitor is widescreen, but not high screen, such as one of the main resolution 1920 * 1080, wide but low. So we moved all header elements (To, CC, BCC, Subject, etc.) to the left side, in order to let you see more content in the screen. Usually, a header element does not need such a long input box, see above [From] and [To] fields of Gmail or Thunderbird. If make it as long as the content, in the 1920 pixels width, it will waste a lot of screen space (width and height both). So we shortened header length and put it at left side, in order to fully and reasonably use the width and height of the screen. In the era of low and standard resolution (e.g. 800 * 600, 1024 * 768, etc. ), the traditional email composing layout works better. But today, the most popular monitors use widescreen (e.g. 1366 * 768, 1920 * 1080), as above, our innovative layout works better!